Rose joined Moving On Tyne & Wear after being unemployed for a significant period of time and was struggling to manage her mental health. Hi there, I’m Rose Juliette. I used to go under a different name when I first came along here. During my time with Moving On Tyne & Wear I actually transitioned as a transgender woman. I first got involved with Moving On Tyne & Wear after I’d been to another charity which was Together in a Crisis after they’d helped me address certain issues I had with debt at the time. I’d been out of work for around two years due to mental health problems and I didn’t really have a good… I wasn’t really capable of making it myself… doing the basic things, you know, getting out the house, getting out of bed, keeping myself hygienic and actually interact with the rest of the world. I was becoming a total shut-in really. In the past, I’d suffered from depression, anxiety, and I had experienced, a few years prior, psychosis due to the suppression of my identity. It caused a psychotic episode. After all of that, after recovering from the psychosis, I had my first dip of depression. I was so terrified that I would fall back into that psychosis. I was seeing a therapist in Byker who was helping acknowledge what was going on with me and my identity and how I need to stop suppressing myself and stop suppressing myself from being myself. That was obviously a huge source of where my mental health issues were coming from. Through suppression. Whilst I was getting help accepting my mental health disorder, Tom from Moving On Tyne & Wear also helped me, kind of, get involved in integrating again as the new me. He’d put me through to Recoco which is the recovery college in Newcastle. After he’d put me in touch with the recovery college I’d managed to do a lot of really good things over there with my wellbeing, getting some time to socialise with other people who are like-minded. Tom also found me groups in the North East that dealt specifically with trans people, LGBT people. I managed to get involved with some LGBT groups and some trans groups which was really helpful. It was really useful to meet other people who were going through similar experiences to me and I ended up being able to benefit their lives because of my experiences. I started to really get involved with the community. After I’d been doing that for a while, me and Tom realised we were starting to meet the goals we were trying to meet. Whilst I wasn’t necessarily directly going into a job, which is what I thought I had to do, and certainly, what I felt pressured to do by the jobcentre, I was actually honing a lot of skills, actually making myself well through the resources that were available. I am now working towards actually doing the same thing and actually helping people at the Recovery College as a facilitator there. 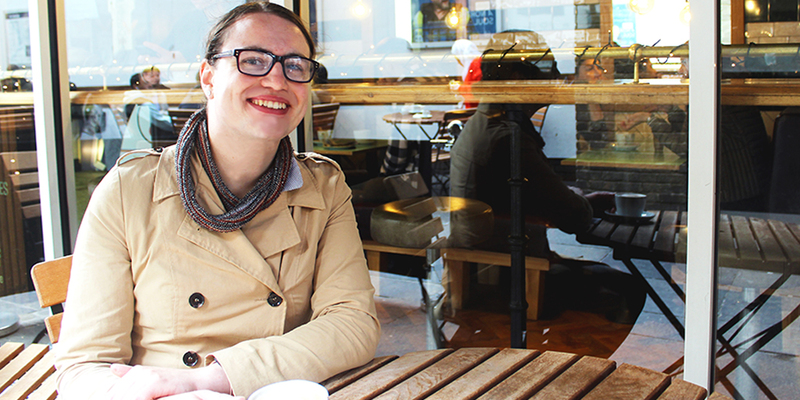 I’m trying to get involved with groups within the North East that are helping LGBT people. I’ve started teaching vocal feminisation techniques to some trans girls within the local area. I’m just getting involved with the communities that I’m part of and that’s really been a benefit to me. Another huge part of what Tom has helped me get involved with was Project North East. Project North East help people get self-employed especially if they’re from a position where they struggle to do so normally. I’m slowly starting to build up some self-employment in those areas with teaching guitar, performing, teaching signing, and all of those things as well. I ultimately want to try and integrate those two things together and have the wellbeing and mindfulness that I’m teaching at the college to help people with mental health. And I want to integrate that with the music and music wellness to help people find wellness by the use of music because I think music is a wonderful wellness tool. It can be really beneficial to people’s lives. Me and Tom kind of finished our sessions together. Tom set me up to get a qualification. It was a level two qualification in mental health awareness. I think that will help me both with my confidence to feel like I am responsible enough to actually be telling people about mental health and wellbeing but also it’ll really help me prove that to potential clients once I start using my mental health techniques as self-employment. I’ll be able to take that qualification, take all the resources that I’ve been given and been made aware of through all these different companies in the North East that are really trying to help people, and really kind of use that as a shared experience to get a leg up myself and start working in mental health.